Increase road safety and avoid costly fines. 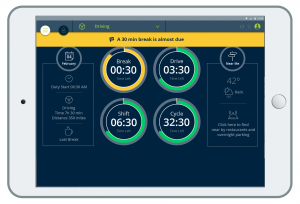 GreenRoad in-vehicle hours of service (HOS) alerts let drivers know when it’s time to take a break or take a timely action. Getting started is simple – our mobile app makes GreenRoad easy to install and access using the same device drivers use for GPS tracking, routing and other workforce management applications. 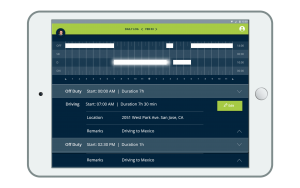 Increase road safety while reducing driver paperwork. GreenRoad’s mobile app streamlines record-keeping, reduces driver interaction with logs, and increases accuracy by automating key logging processes. ECM connectivity provides time-stamped logging of vehicle mileage and engine hours. Drivers and fleet managers can review, print, email, and display logs at any time via the GreenRoad web portal dashboard or from their vehicle. These logs are ready for both roadside inspections and back-office use. Reduce exposure to fines and penalties by keeping both driver and fleet compliance records spotless. GreenRoad in-vehicle HOS alerts keep drivers safe and in compliance with HOS regulations in realtime. Dashboard indicators warn drivers of impending violations, so they can take timely action to prevent them.